For top quality dental implants offered at competitive prices, call Lawrenceville Family Dental Care. We are a comprehensive, family dental practice that offers general, preventative, cosmetic and restorative dental services for children and adults. Our dentist is an expert in placing dental implants and use this revolutionary tooth replacement system to restore the smiles of patients with missing teeth. Using the latest in dental implant technology and procedures, our dentist creates beautifully, healthy, long-lasting smiles. Dr. Ashish Patel is the Lawrenceville implants dentist you can trust to provide top quality dental implants as well as other restorative dental services. An implant is a titanium "root" that can be placed in the jaw and integrated into the bone to support a crown or bridge, or to secure a complete denture. Dental implants have an extremely high success rate and are now considered the standard of care for replacing missing teeth. Most patients with missing teeth are candidates for this procedure. 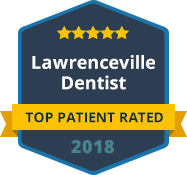 The dentist and staff at Lawrenceville Family Dental Care are pleased to offer this life-changing treatment to patients in Lawrenceville and the surrounding areas. If you want to get more information about tooth restoration or to find out if you are a candidate for dental implants, contact Lawrenceville Family Dental Care today to schedule a consultation. Our practice is currently accepting new patients and we would welcome the opportunity to care for you and your family. Our practice accepts most forms of dental insurance and also welcomes patients who do not have dental insurance. We thank you for allowing us to take care of your dental needs and we look forward to exceeding your expectations.